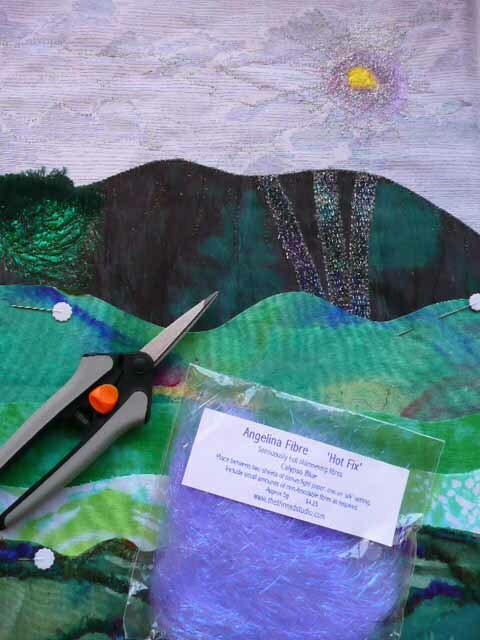 Joining the AusNZ art-quilters group this year, has thrown challenges that could not be resisted. 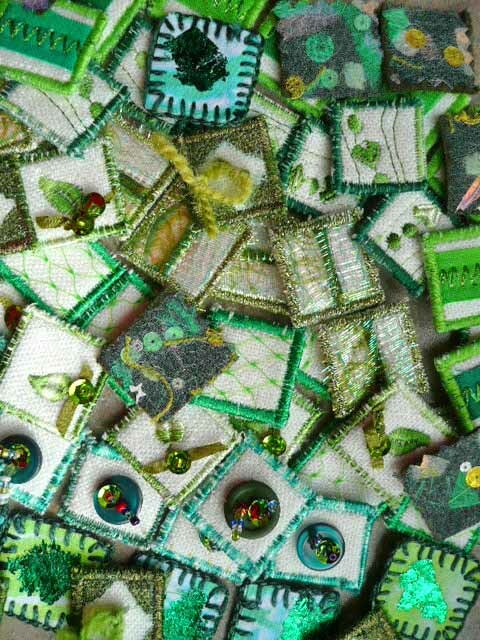 One challenge has been to make seven sets of nine inchies in fabric, adopting the theme “green” and being one inch square. Being my first time ever to make inches I took the theme quite literally and concentrated on the different moods and texture of green – leaves are a favourite so they had to be included. Today my 84 inches were divided into 7 packs and mailed to the moderator for distribution to other 19 inchie fans. In mid-June these will be swapped with others from our group of 20 “inchie buddies” from NZ and Oz. This is what mine look like. What do you think of my first attempt at these little ones? Playing around with various types of Angelina Fibres, I find that the Hot Fix is easy to work with and it produces a very glossy finish. Lots of ideas are floating around my mind – after creating a myriad of shapes using my iron, stamps, and other items from the bottom of my cupboard. A soldering iron is one of the further approaches I plan to trial. Angelina is an amazing product to incorporate into art-quilts. A workshop is arranged for mid-June whereby I will be encouraging a small group of ladies to get in there to play and experiment! All these pins for one lap quilt! All of these pins were removed as I quilted the top using a favourite variegated thread. I received a request to make a quilt that features the feline animal – Ah, I do have such lovely catty friends! Out came my range of cat fabrics and off to the shop to purchase a few more; then within a week this quilt was created. Took about three solid days to do, mainly because of interuptions from my own cat (oversees everything) but also due to the close quilting I thought this quilt deserved. A special label is now being designed to suit the recipient’s situation, before this quilt goes to its new home in the mountains. I think the lady who receives this will be over the moon – not only will it keep her warm during the oncoming cool winter conditions it should delight her heart as well. Quilt for sale – SOLD! Previously my blog identified that I no longer wanted this art-quilt. 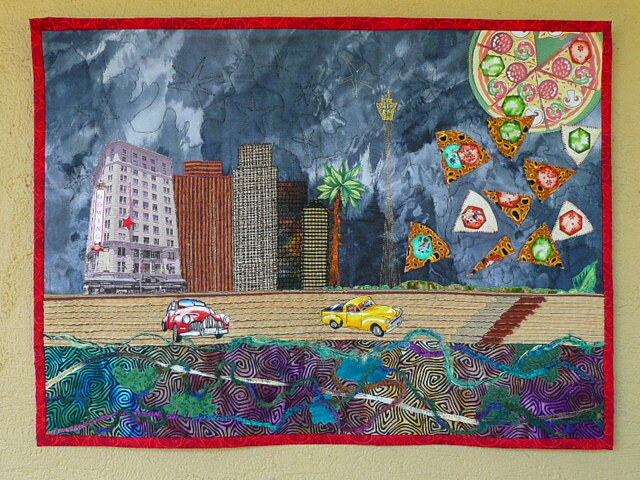 It had travelled Australia for 12+months as part of a travelling exhibition with the Quilters’ Guild of NSW Inc.
Now I am thrilled to say that “Gowing to Pizzas” has gone to a good home. A young man who has a strong past connection with the store Gowings wanted it. How serendipitious is that? So I feel that it is a very happy bye bye to this cute little quilt that I made when challenged with the theme GOING TO PIECES. Autumn is the time to be in Orange. 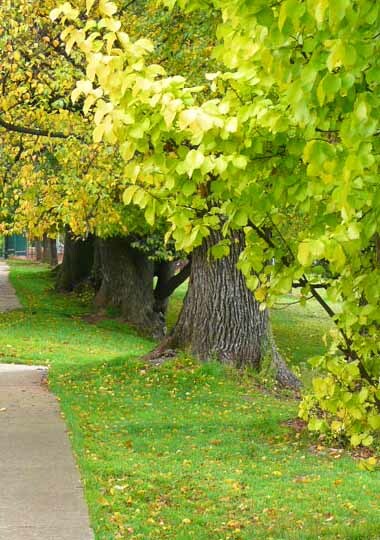 Departing Kinross School where Fibre Forum was held my eyes zoomed in on the changing colours of trees leading me to the carpark paddock. I just had to capture the glorious colours on my digitial. Now that I have been home for one week now, I am left with the feeling of golden times making new friends, discovering new creative skills, sharing the wonderful works produced by other creatively talented people, and being amongst the changing colours caused by autumn. Time has passed quickly during the past week – I hope I am lucky enough to venture forth again to the Fibre Forum at Orange in 2010. I am looking forward to seeing what workshops are being offered next year. Meantime there is much catchup work to do, so time to go…and put my head down. 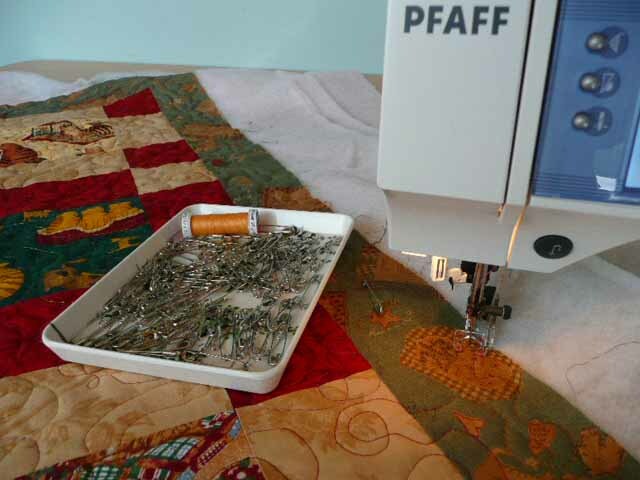 You are currently browsing the Crafty Quilting with Pamela blog archives for May, 2009.